Growing up in a small town in Mississippi in a single-parent household, Jaquaious (Jay) Little had limited access to resources and experienced lots of change. His mother and father broke up very early on in his life. His mother later married and divorced his stepfather when he was in first grade. She completed college with a degree in education and became a preschool teacher to support their family. From a young age, Jay was always fascinated by computers and technology, and displayed great intellectual curiosity. Determined to learn more, he began to research computers. He took apart old phones, computers and other devices so he could learn about how they work. “Though I didn’t know anyone in computer science and I couldn’t afford private courses, I wanted to find ways to fill in the gaps to advance my knowledge,” Jay said. He attended an all-black high school in Columbus, Mississippi, where most students came from low-income families. Funding for science and technology classes and student activities were scarce and expectations low. Because the administration at his high school was ever-changing, it was hard to get any funding for STEM programs. Jay had four different principals during high school. Few classmates even thought about college. But Jay did. “The odds do not have to defy you, you defy them,” he said. He was inspired by an uncle who attended college and who was an important role model; his dream was to become a computer scientist, specializing in software engineering. He started taking online courses from Code Academy. His mother and uncle challenged him to get involved and make a difference, while furthering his education. “I simply asked myself, how can I bring more to my school and community?” Jay said. He became involved in the Mayor’s Youth Council, which included students from all of the high schools in the county. The city relied on the Youth Council for input on proposed developments in the city. He also joined Lowndes Young Leaders, a leadership development organization supported by the local chamber of commerce and Mississippi University for Women. At his high school, Jay established a student government group. The school had not had student government leadership in 20 years. They organized activities including homecoming and pep rallies, while actively voicing the opinions and concerns of the students. This leadership experience helped Jay find his voice as a leader and was a major turning point in his life. “My leadership experience in high school taught me that, no matter the circumstances I faced and general apathy, you need to empower yourself and shape your own experience,” Jay said. Fortunately, a friend introduced him to the National Society of Black Engineers (NSBE), whose members helped him turn things around. 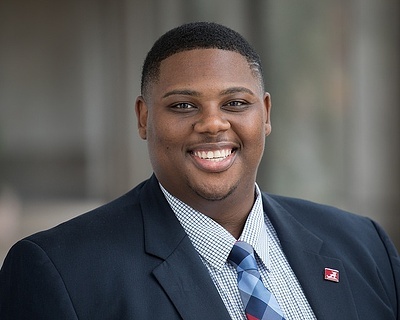 NSBE seeks “to increase the number of culturally responsible Black Engineers who excel academically, succeed professionally and positively impact the community.” Jay has been involved with the organization throughout his college career, and now serves at the chapter president. He also joined the Society of Women in Engineering (SWE), in order to support, celebrate and promote women who are pursuing careers in STEM. He has begun research in the Human Technology Interaction Lab under the advisement of Dr. Chris S. Crawford, one of only a few African-American Computer Science research professors at Alabama. Their research is situated in human-centered computing, focused on adaptive and effective learning and interaction through robotics. Jay expects to graduate next spring, earning his bachelor’s degree in Computer Science in just three years—an impressive accomplishment. He appreciates the generous support of the Dream Award Scholarship donors, which helped alleviate the stress of paying for college and allowed him to focus more on his education. This post was updated on November 26, 2018.